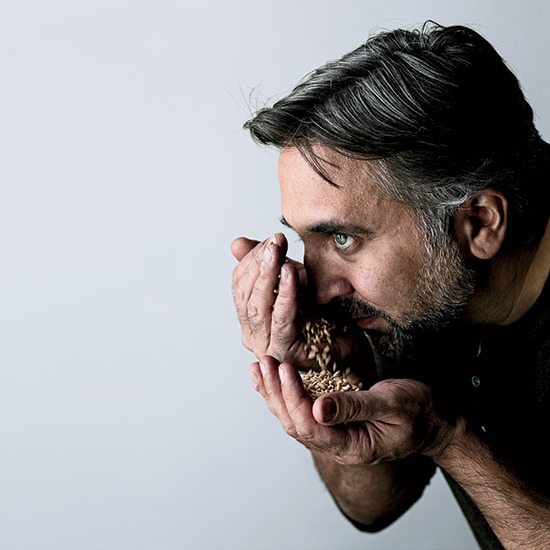 Chef Marco Canora's conversion from cigarettes, bread and sugar to grains like rye berries, amaranth, quinoa and farro had a near-miraculous effect on his health. Despite the good start, by the time he hit 40, his health issues were alarming: sleep apnea, prediabetes, high cholesterol, gout. The white-bread diet wasn’t really working for him. So Canora switched to the dishes that he shares below: nutty spelt pasta with chicken livers; incredible Parmesan broth with tiny grains of amaranth; chewy steel-cut oats with dried cherries. It’s an approach he documents in his new cookbook, A Good Food Day. His conversion to whole grains (or, as he calls them, “intact,” unprocessed grains) had a near-miraculous effect on his health. He slimmed down—in part because the fiber in whole grains helps you lose weight. His blood sugar levels steadied when he cut out refined white flour, which causes a roller coaster of spikes and drops. His gout went away. 1. Deprivation Isn’t a Long-Term Solution. Satisfaction is. On a good food day, eating is a source of pleasure. 2. Ignore Health Buzzwords On Processed-Food Packages. Let the ingredient list guide you. 3. A Twinge Of Hunger Isn't the End of the World. Recognizing real hunger is a key part of learning to feed yourself well. Choose foods with a wide range of flavors, colors and textures. 5. Say “To Hell With It” Every Now And Then. It will increase your chances of sticking to good eating habits.